We are the stewards of the land and our animals and respect and tend to their needs..
To live on a farm one becomes acutely aware of how we are intrinsically tied to nature and that it is a system that defines all life. We were brought to this "Waypoint" in our life seeking health, happiness, and to preserve this piece of land and heritage. 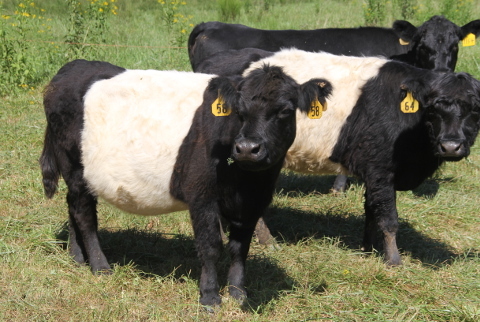 We raise Belted Galloway Cattle for Beef and for the Environment. On average the beef of the Belted Galloway is 46% lower in calories, 72% lower in fat calories, 68% lower in total fat, 69% lower in saturated fat, 57% lower in cholesterol, 19% higher in protein, 67% higher in calcium, and 73% higher in niacin. The Beltie as a beef animal produces exceptionally lean and flavorful meat, with dressed weights well in excess of 60 percent of live weight. MOB grazing, or intensive rotational grazing, means moving cattle daily from one small area to the next small area, so that the cattle can eat all of the available forage, trample 40% back into the soil, providing aeration and fertilization before they are moved to the next small area. These areas are separated by portable electric fences. The goal is to have enough small areas to allow the first grazed area to completely recover, 60-100 days. Before farmers had inorganic petroleum based fertilizer it was standard practice to rotate cattle with crops. This was how the soil was kept productive and healthy - it was sustainable. Think of the plains of 500 years ago, when enormous herds of grazing animals migrated. The herds stayed tightly together to avoid predators, ate everything they could where they grazed, and stayed on the move to new grass. Their migration insured that they had a constant supply of food AND allowed the grazed areas to benefit from their grazing and fertilization. Those were the days of millions of acres of grassland and is how they came to be. The USDA has helped us with granting us a EQIP grant. 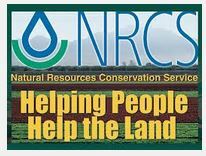 The link on the logo is a paper entitled "Mob Grazing Produces Healthy Soil and Livestock"
Our special thanks to the folks here at NRCS! They have helped us in many ways and are very supportive. The link on the logo is a paper on rotational grazing practices and the benefits.